Fantastic. I enjoyed the "first astronomers" article, too (resolved to look at the three brothers in their fishing canoe, this evening). Really nice view of the Milky Way ! (resolved to look at the three brothers in their fishing canoe, this evening). <<The Five Chinese Brothers is an American children's book written by Claire Huchet Bishop and illustrated by Kurt Wiese. It was originally published in 1938 by Coward-McCann. The book is a retelling of a Chinese folk tale, Ten Brothers. An Emus's neck isn't that long. 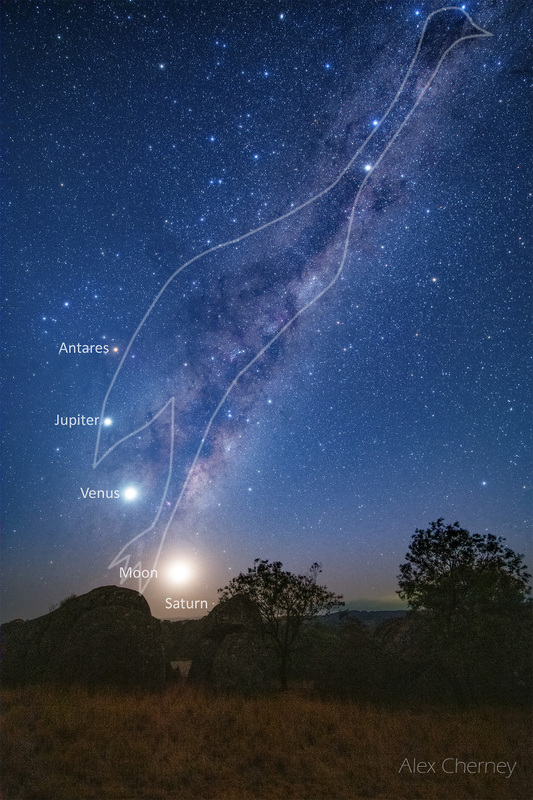 Judging from the photo, the emu's head is near Alpha Centauri and its shape is suggested by the dark clouds rather than the bright outline of the Milky Way. The Planets is based around astrological themes, not astronomical. Yes four planets: including the Earth! I can't really agree that the aborigines were the "earliest astronomers". Telling stories about the sky certainly doesn't make one an astronomer. If anything, it trivializes the word. Noting the number of days from one full Moon to the next could be called early astronomy. But if the aborigines did that, so did other primitive groups. Did they develop a mythology about the red planet moving retrograde when it was brightest? Or how the highest and lowest tides occurred when the Moon was new or full? Or how lunar eclipses only happened when the Moon was full? Those could be called early astronomy. But did ANY culture develop such mythology prior to systematic study? I'm in no way an expert, but I've never heard of one. If anyone has examples, I'd be interested in them. I am not sure there are definitive claims that Australian Aborigines were the first astronomers, but they have been described as such. Given that the cultures of these diverse groups were maintained through millennia, almost entirely as spoken stories, and given their tragic recent history since European settlement, it is no surprise that there are large gaps in what we know of these cultures. The wider awareness of Aboriginal astronomy and its continued rediscovery, is a fairly recent thing. Based on what little I know of the topic, I would not hesitate to call it astronomy. Ancient astronomy. And I find it fascinating.